Hold on tight for a thrilling, fast-paced adventure unlike any other with The Rescuers Down Under! The world's bravest mice, Bernard and Miss Bianca, answer a call for help from deep in the heart of Australia's vast and unpredictable Outback! With a crazy crew of local critters, these top mouse agents rush to the aid of Cody, a young boy struggling to save a magnificent eagle from a ruthless poacher. But with restless natives and unexpected dangers popping up at every turn, who knows if they'll come to the rescue in time! Say "G'Day" to a classic Disney adventure full of unforgettable characters and incredible animation in this down-under delight you'll cherish for years to come! After all of the "dark years" experienced by Disney after Walt's death in 1966, the studio's animation department experienced a well-deserved resurgence with the 1989 release of The Little Mermaid, which was both a critical and financial success. This began a consistent string of Disney hits. Although the grosses dipped a bit around 1995-1997, they remained fairly strong for more than a decade. Every rule needs an exception, and that's where we find 1990's The Rescuers Down Under. It seems somewhat like an odd fallback as it pops up between Mermaid and 1991's Beauty and the Beast, another box office hit that also became the first-ever animated film to get an Oscar nomination for Best Picture. By no stretch of the imagination is Down Under a bad film, but it does stand out as a dip in quality amidst such strong competition. While Down Under remains a minor Disney work, it's a fairly fun one, and it easily outdoes the movie upon which it was based. 1977's The Rescuers is arguably my least favorite of all Disney's animated works. I thought that movie was a dull and cutesy drag that succeeded on very few levels. Down Under, on the other hand, may seem light and basic compared to its era-mates, but the film itself is fairly entertaining. 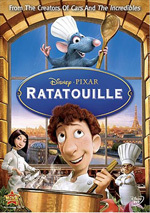 Ironically, the story is one in which our heroes - Bernard (voiced by Bob Newhart) and Bianca (Eva Gabor), returning members of the Rescue Aid Society (RAS), a mouse-run altruistic group based in New York - perform little active work until near the end of the film. A young Australian boy named Cody (Adam Ryen) helps and befriends a trapped golden eagle named Marahute. When nasty poacher McLeach (George C. Scott) discovers this connection, he kidnaps Cody so he can wring the info out of him. A little mouse who Cody saved sends out the alert, and our heroes from the RAS fly over from New York on the back of Wilbur (John Candy), an albatross who takes over the same position filled in the first movie by his brother Orville. When they get to Australia, they meet up with local Outback-savvy mouse Jake (Tristan Rogers), who immediately vies against Bernard for the affections of Miss Bianca as they try to find and rescue little Cody. As I alluded, our heroes have little to do for most of the film. Cody and the other trapped animals he encounters at McLeach's lair all seem fairly capable of success on their own. No, they don't make it out of their cages by themselves, but they display a great deal of grit and ability. As for the exploits of the mice, Jake does most of the work there. He's the one who takes charge and gets things going, while our protagonists are just along for the ride. Inevitably, Bernard goes into action by the end to redeem himself. All his bumbling was necessary to make the Jake and Bianca romantic subplot viable. Still, Bianca never does diddly, and I couldn't help but think it was odd that the heroes of the story had so little direct effect on the outcome so much of the way. Nonetheless, Down Under provides a pretty good adventure tale. Although the overall level of animation seems unspectacular, the artists do create some absolutely lovely Australian vistas. At worst, these look convincing and bold, but at their best, they become positively breathtaking, as during the computer-assisted flights conducted by Marahute. The latter scenes are simply gorgeous and offer some of the most visceral and exciting animation seen from Disney. Although the rest of the film doesn't live up to those moments, it remains fun and engaging. It's a slight story with very little depth, but the characterizations are good, especially in the case of Cody, who seems more real and less of a cipher than most Disney children. Unlike Penny in the first movie, he's not just a little cutie along for the ride. The vocal talent seems strong, with a fun performance from the late, great Candy, and nice work from Scott as well, who neatly straddles the fence between evil and comic as McLeach. All curses aside, Disney proved it was possible to outdo an original product with a sequel via the modest success of The Rescuers Down Under. Granted, since the prototype in question was arguably their worst film, that doesn't say much, but take the glory where you can, boys! However tainted its predecessor may have been, Down Under provides a mildly entertaining and exciting little action story that's sure to interest most Disney fans. The Rescuers Down Under appears in an aspect ratio of approximately 1.66:1 on this Blu-ray Disc. Overall, this was a positive presentation but not a great one. Sharpness seemed pretty good throughout the film, as the majority of the action appeared reasonably crisp and well-defined. Some mild softness intruded at times, but not very frequently, so expect an image that featured good delineation. No problems with jagged edges or shimmering interfered, but I did notice some light edge haloes at times. Print flaws were a non-factor in this clean transfer. Colors seemed mostly accurate and rich. A few shots could be a bit pale, but the majority appeared lively and vivid. Black levels looked quite deep and dark, and shadow detail was similarly thick without displaying excessive opacity. Despite a few problems like softness and edge haloes, the image was usually satisfying and merited a “B”. For its age, the DTS-HD MA 5.1 soundtrack of Down Under worked well. The front soundfield displayed some compelling activity, as stereo separation for music and effects was quite good, The audio appeared distinct between channels, and the different speakers also blended well. Panning seemed clear and smooth. The surrounds provided gentle reinforcement of the forward channels but complemented them fairly well. They appeared rather quiet in comparison with the active front speakers but they provided enough information to warrant their existence. Snow scenes fared well, and a few other environmental bits added to the spectrum to a satisfying degree. Audio quality was good. Dialogue seemed vaguely flat on a couple of occasions but it usually sounded warm and natural, with no issues related to intelligibility. Effects were crisp and clean and also displayed some nice low-end at appropriate times, such as when McLeach's truck rumbled past us. The music seemed equally bright and deep, with pretty nice bass there as well, particularly due to the presence of some low "Australian" instrumentation - I think it's a didgeridoo, if I'm not mistaken. Whatever the case, I liked the soundtrack of Down Under, as it seemed clear and rich and complemented the action. How did this Blu-ray compare to the 2000 DVD release? Audio was a bit warmer and fuller, but the visuals showed the most obvious improvements. The Blu-ray demonstrated better accuracy and vivacity; it also lacked the print flaws that marred the DVD. Only one extra accompanies the film. The Making of Rescuers Down Under runs 10 minutes, 33 seconds and includes producer Thomas Schumacher, directors Hendel Butoy and Mike Gabriel, art director Maurice Hunt, supervising animators Kathy Zielinski, Ruben Aquino, and Glen Keane. They tell us a little about story/characters, art/animation and research. The program remains relentlessly perky, but it throws out just enough useful material to make it worthwhile. As the disc starts, we encounter ads for Cinderella and Finding Nemo. These also show up under Sneak Peeks along with promos for Disney Parks, Secret of the Wings, Planes, The Aristocats and Beverly Hills Chihuahua 3. No trailer for Rescuers Down Under shows up here. 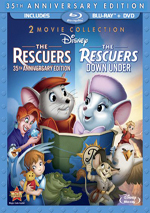 The package also includes a DVD Copy of Rescuers Down Under. This gives us a full retail version with a handful of extras. Note that the trailer appeared on the old DVD along with a “read-along storybook” and a trivia game. It’s too bad the trailer goes missing, but I don’t mind the omission of the other pieces. The Rescuers Down Under will never qualify as one of Disney's classics, and it's probably always going to seem weak when compared to the studio's other work from the era. However, on its own it offers a moderately delightful experience. The Blu-ray presents generally good picture and pretty strong audio but lacks many supplements. This turns into a reasonably positive presentation for a minor Disney pleasure. Note that Rescuers Down Under can be purchased only as part of a two-movie collection. The Blu-ray also comes with the original Rescuers as well as DVD copies of both films.